Q: I’m sure you knew better than most what was going on every Saturday, Al! I wasn’t even aware of your coaching exploits. What was your career record? AP: I don’t really have that. I was there 18 years and I was selected on three different occasions as the College Coach of the Year in the state of Nebraska and was in the Nebraska Football Hall of Fame after that, of course. That was not the objective, but it was nice. 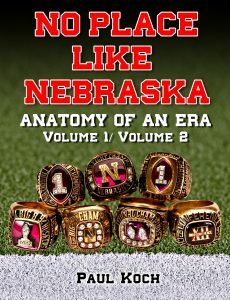 Q: Does any one particular Husker game stand out to you more than others? AP: Probably the one Husker game that’s stood out as much as any, was how dominant Nebraska was in the National Championship game when they defeated Florida in the Fiesta Bowl for the National Championship. Not necessarily Tommie Frazier’s outstanding run (which is shown over and over again), but the game as a whole: where Nebraska was the underdog going into that contest and yet emerged as totally dominant in every phase of the game. As to that particular day? How superior Nebraska was in every part of the game? It wasn’t a close ballgame in the way great contests are judged (like the Game of the Century that Nebraska had with Oklahoma and some of our other contests), but that would be the one from my point of view. Q: Did anything stand out to you as far as the mindset of the athletes of that time? A culture, a mood that made those teams special? AP: Well, I think it was Tom’s organizational structure with recruiting, with the actual practice sessions, and the fact that he recruited a large number of walk-ons. The walk-on program was one of the major factors that enabled him to do what he wanted to do as long as he had enough people. He could have several stations going on at the same time (because everybody knows that a lot of coaching is repetition). And to go through the drills and go through those activities and to repeat them day after day after day? With a large number of people you could get this done. So his squads, the number of people that we had out for football, were much larger than the average institution had, and it allowed him to have a greater number of drills and activities going on at the same time. Nebraska was fortunate that in our state there’s no other division one school that’s going to recruit the athletes. There is no professional football in the state, either (you have to go Chicago, Denver, or Kansas City), so the fan base was more supportive of the college program. And it assisted in the product that Tom and Bob were able to produce. Tom did an excellent job in recruiting and keeping this staff and having quite a bit of diversity, and they related extremely well to the student-athlete. You could see the program that he was building and compare it as we’d go to the games on Saturday, whether it’s the Oklahomas, Kansas States, Iowa States. And even the outcome at the end of the year with the bowl games? The situation aided and allowed him to be able to carry out what he thought needed to be done to be competitive on a national basis. Q: Any idea what kind of numbers other schools would have had at that time? 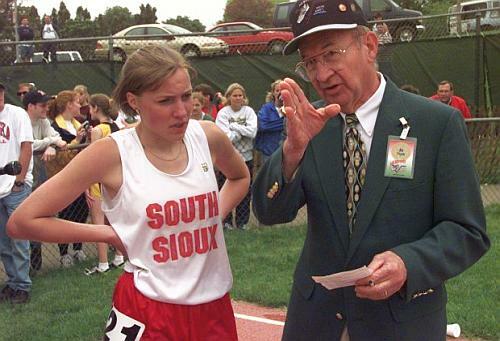 AP: I don’t know the exact year, but earlier in Tom’s career and in Bobs career we didn’t have the strict limit on the number of scholarships that could be granted, and Nebraska had larger squads than many of the schools do today. So as a result some of the other schools weren’t able to recruit the top athletes, because the schools like Oklahoma, Nebraska, Alabama, Michigan, Ohio State, they had more quality student-athletes coming out of high school, junior colleges. (And of course, there’s a completely different situation today, because the numbers are smaller as dictated by the NCAA, the number of people on scholarship.) Rules and regulations sometimes will change the opportunity that schools had to one time recruit their share or more than their share of student-athletes, making them unavailable to other schools. Q: Stockpiling, so to speak? Defensive recruiting? Q: During your term there in the ’90’s, what was the greatest challenge you encountered? AP: The challenge, I think, was the issue of how competitive the recruiting was and how complex the rules & regulations for the NCAA or the respective conferences certain institutions belonged to; how complex those rules and regulations are, and how easy an institution can violate some of those rules and regulations and possibly not even be aware of it. And yet, the pressure to recruit? There needs to be some kind of program on campus whereby people could make sure their coaches were informed, were well aware of what’s permissible and what’s not permissible, what the impact might be. Because if a school was in violation they could lose scholarships or in some other way be punished, and that would be a blow to the institution where they could be contender one year and then the bottom of their league the next few years. There was a heavy price to pay if an institution or coaching staff or a program stumbled, so I was a critical part of keeping the program at the high level and yet being within the rules and regulations of the governance, whether it’s the institution’s, the conference’s, or the NCAA’s. Q: And the whole Big 8 to Big 12 switch- is there anything you think Nebraska could have or should have done differently in setting that up? AP: I think the Big 8 was a great conference. There was a congeniality among those 8 schools that maybe was a little stronger than it might have been in the Big 12. Bringing the Texas schools from the Southwest Conference to form a conference of 12 was basically done for monetary reasons. There’s no question that nationally they would have a greater opportunity to get to the major bowl games, have the national rankings to increase attendance, do a more effective job recruiting nationally, but it changed the culture a little bit, the relationship between the institutions, I think. You can see that today: there’s a lot of money in the state of Texas where they’re able to do things because of financial reasons and support that they have from boosters, to make the competition even greater in the athletic arena. For example, I was talking to Tom Osborne after he accepted the Athletic Director’s position here recently, about what problems he sees that are different from when he was here as a coach. And he said the emphasis was on the budget and funding, that every one of the respective sports in the program has a budget problem that is real, and that improving and maintaining facilities is an ongoing situation. So that’s a big issue. And it’s not the most favorable for some people who don’t have the resources to tend to those sort of things, no question. Q: Sounds like a typical farmer/rancher. You give it your best shot and you make do with what you can? Take what rain the storm clouds give you? AP: That’s right. I was born and raised on a farm, but my parents moved when I was in high school, so my early days were on a farm, yes. Q: Good football training, a farm or ranch is. No? Q: You were in the service for World War II, right Al? Any special travels or experiences? AP: I was in the US Army. When I graduated from high school the draft was still on for World War II. I thought I could beat that draft so I enlisted before I was drafted. (So I wouldn’t be assigned to the US Army Infantry. That’s where most of the people were being drafted into.) And lo and behold, I still went into the service as an infantry replacement and did training in Camp Fannon, Texas, right out of high school for 17 weeks, and then shipped to Fort Meade, Maryland, because everything was hot and heavy in Europe in World War II at that time. The day we arrived in Maryland, VE Day was declared and the war was over in Europe. So there was a little problem with a number of several thousand of us that were on our way to Europe, so we took a little additional training in Washington, DC, and then we shipped across the country and left Seattle to go to the Pacific (because quite a bit of action was still anticipated at that time). We stopped at the Hawaiian Islands to do amphibious training and be issued our M-1’s on the rifle range and to get ready to go to Iwo Jima or Guadalcanal or some of the islands at the time being seized and held by Japan, and they looked at my record and saw that I had taken a typing class in high school and pulled me out to work at a separation center in Hawaii. And I stayed there for 2 years to finish my enlistment. So I was blessed by what I took in high school and spent my time in the Hawaiian Islands until I was discharged from the service. And I was discharged in August and enrolled that same month in 1946 into Doane College. Q: Who could have thought that one high school typing class would have such a profound effect on your life? AP: Exactly, and I probably took it to get out of some tough science class or something, (laughs) I’m not sure. Q: There was probably a good looking girl or two in the typing class, I’d guess…. Q: What was your greatest accomplishment, owning the tools and skills you brought to the program? AP: The ability to work with a variety of publics, whether it was the administrative people in an academic setting, or the instructors in the departments and the various disciplines in the institution, or whether it was the coaching arena or whether it was the students. I always made an attempt to relate appropriately to a variety of publics and to be able to see the big picture as to what our real objective was, and find the appropriate way to accomplish our goals and objectives. Q: And the real objective would be to create an educated citizenry? AP: In general, that would be the best way to put it.